(Photo credit Matchroom Boxing) IBF super bantamweight champion Carl Frampton (22-0, 14 KOs) showed a lot of heart and determination in gutting out a 12 round split decision on Saturday night in beating WBA champ Scott Quigg (31-1-2, 23 KOs) by a narrow 12 round split decision win in their 122lb unifcation fight at the Manchester Arena in Manchester, England. The judges gave the fight to Frampton, but Quigg easily could have won that fight. If not winning, it could and perhaps should have been scored a draw. Quigg landed the far better punches in each round, and he came on strong in the second half of the fight to do the better work. I had Quigg winning two of the first six rounds and four of the last half to deserve a draw. The scores were 115-113 for Quigg, 116-112 and 116-112 for Quigg. Frampton was fighting on fumes in the last three to four rounds, and his punches had nothing on them. 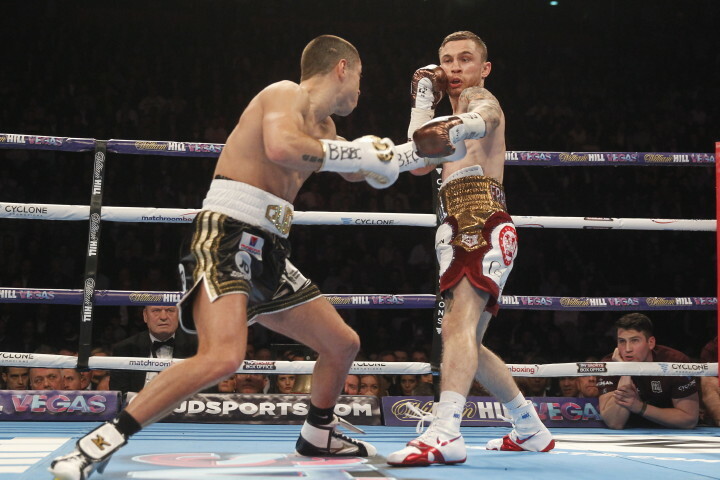 There was a lot of good action from the 9th round, as Quigg began to connect more and more with his big power shots. Frampton stopped boxing and started slugging with Quigg, but his punches didn’t have nearly the same amount of power. Quigg’s shots were quite a bit more powerful. Quigg had Frampton hurt in the 11th round after connecting with a peach of a right hand to the head. He followed up with two more shots that connected before Frampton was able to cover up to keep from getting dropped. It was a very good round for Quigg. To Frampton’s credit, he fought with a lot of energy in the 12th to preserve his victory. There needs to be a rematch because I believe Quigg got a raw deal. He deserved a draw if not a win.